Both categories have played two new days of tests with Luca Marini and Gabri Rodrigo leading the way in their respective displacements. The lower categories of the World Cup finalized details nine days after the start of the official preseason for them. After two days of private practice in the Ricardo Tormo, several teams of cylinder paths have returned to the track and this time, they have rolled on the asphalt of Jerez to arrive in the best possible way to the first tests of the year, which They will start next February 20, also, in the Andalusian track. To continue with the preparations for the season, some thirty pilots adding Moto2 and Moto3 have made an appearance in the first of the two days planned for these trainings, where they have enjoyed unbeatable conditions with sun, and a temperature that has reached 20 degrees. The pilots of the intermediate category have dominated in the number of participants with respect to the small displacement and the entrance of Triumph to the World Championship, has a lot to do. Knowing every detail of the new engine is an essential mission to fight for the first positions and from the Estrella Galicia 0'0 Marc VDS know it very well. Also in the Valencian layout, again Álex Márquez and Xavi Vierge were two of those who appeared on scene. The duo of the Belgian structure is facing a crucial season to take the team to the top, in addition to having personal goals on both sides. Nothing can fail and after the first day, both Márquez and Vierge have accumulated a total of 91 and 89 laps respectively to strengthen their work. The sensations have been good after a hard day of work and despite the fall of the ilerdense, the Spaniards have finished in fourth and fifth position with Jorge Navarro sixth. In the garage of the SKY Racing Team things have gone better. Luca Marini, who already dominated the table in the last test of November, finished the day at the top after 36 laps, with a time of 1: 41.827. A lower mark than the one that gave the pole to Baldassarri (1 : 41.925) the last season on the Andalusian layout. Today, the workload of the Italian has been much lower than that of the couple of Marc VDS but the result seems to have been more effective. Sam Lowes was second to only 42 thousandths of the brother of Valentino Rossi, with a Thomas Luthi that returns to the category, third, also rolling within 1: 41. In Moto3, dos of its main attractions such as Romano Fenati and Arón Canet, have not been present on the Andalusian layout. 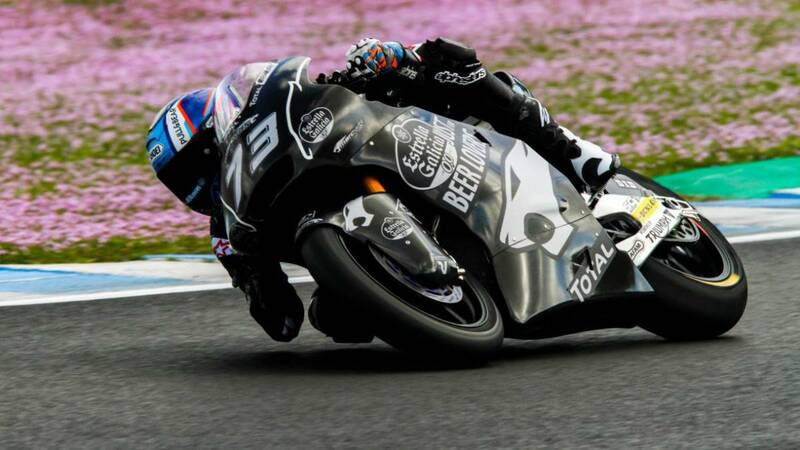 Both will wait next week to shoot in Jerez and today, Gabri Rodrigo has been responsible for setting the tone. The Spanish-Argentine has taken command in the category with a reference of 1: 47.254 and after him, Foggia and an Alonso Lopez who has been the best Spaniard, have topped the first three positions within a difference of less than half a second.